Kate- how awesome are you????? We have the first/then visual schedule on the iPod touch and if you press "pick images" when in the "create step" you can import the images saved on your iPod. My kids use ireward, iinteract and icommunicate...all cost effective and worth it. Love emotions page on iinteract...photos too hard for kids to read. THanks for the great list! 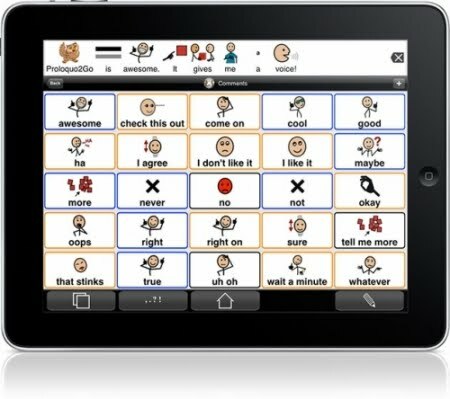 I also use iinteract in school...emotion pictures are fab...extending kids utteraces while reducing upset. Other kids use photos..great resource. Love proloquo too. Pictures are fantastic. Your list is amazing...thank you. Thanks so much for the info...pecsforall is GREAT! Thanks! Pecsforall is not an iPad or itouch app. There for this is not the place for it. I think picto selector is pretty great but the aggressive commenting on this blog and other social media venues is starting to be irksome. Pecsforall pushing doesn't belong in mentions of iPhone apps here or else where. Hi there! this blog is soo helpful! thanks. I was looking into an app of somekind where there is somekind of platform where I can upload a picture from my itouchs photoalbum and can record the word for it. for example, take a picture of her bottle, not just some drawing of a bottle, but her actual bottle and record "baba" so she can point at it and therefore we would both hear the word "baba" do you know of any apps that will allow me to use my own pictures and record my own words? I use MyTalkTools and I LOVE IT!!! I've been able to upload symbols and even small movie clips. Children come to my school with IPADs from home, and I'm able to log onto my own boards from their IPAD through the wireless server. I can even make several boards for different students and save it on their workspace online and then log onto one particular child's board with the iPAD. The creater of the program is super nice and when I ask him questions he answers promptly!!! 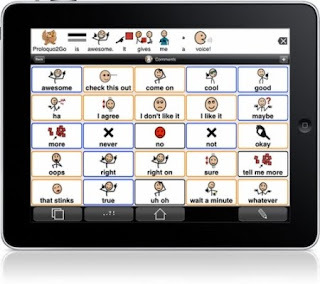 MyTalk does allow you to record your own sounds, or use their text-to-speak function. You can upload any picture as long as you save it right.